Elder law is an extremely rewarding and lucrative area of law. Still, taking on this new and unfamiliar practice area can feel overwhelming. Whether you’re just contemplating transitioning into elder law, or you’ve already added this practice area to your firm, you may be wondering what resources exist to help you as you make the move. The good news is that no matter what your particular challenges — from learning areas of law that may be unfamiliar, to learning how to effectively market your practice, to streamlining the processes involved — tools do exist to help you. These resources will be instrumental in becoming successful as you navigate this new practice area, and help you grow your business by serving some of the more than 47 million Americans that are part of this country’s aging population. Understandably, you may be skeptical about investing in tools early on, and wonder how quickly you’ll see the return on investment (ROI). 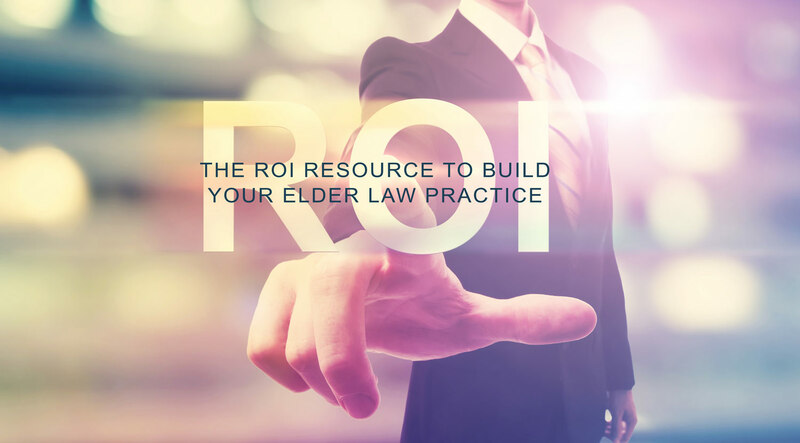 The fact is, by investing in some key resources, elder law attorneys realize an ROI very quickly — and in most cases it only takes a couple of clients to cover the initial cost. So, let’s take a look at some of the most important resources that will contribute to the success of your practice and how they’ll help you generate the ROI you’re seeking. Researching and drafting client documents can be extremely time-consuming. In fact, it can take upwards of 10 hours per week just to execute this single task. With the help of document-drafting software, you can streamline this process to more efficiently generate a wide array of documents, including those pertaining to general estate planning, special needs planning, Medicaid planning, and veterans pension planning documents. That means more time to devote to meeting new clients to grow your practice so that you can begin generating revenue sooner. Just as with any other practice area, the laws around elder planning are constantly evolving. It’s important to have access to educational information related to legal theory and strategies for elder law, VA planning, estate planning, special needs planning, and other relative topics. Tools including webinars and live events will ensure you stay abreast of pertinent information and changes to best serve your clients. Compared to researching all of the changes and updates surrounding elder law, educational tools can save you a minimum of two hours per week. Again, that’s more time you can devote to marketing your practice and meeting with new clients. You’ll benefit from resources for navigating everything from conversations with clients and their families about proactive planning, to staying top of mind and relevant with your clients and referral sources. Client-facing resources are also critical to engage existing clients and to reach new ones. Newsletters, for example are a powerful tool for maintaining regular contact with your clients so that you can share valuable information with them even when they’re not sitting in your office. ROI calculators are another powerful client-facing tool. These can be used to show clients the return on their planning investment for up to 5 years, as well as the number of years until their assets would be exhausted with different planning and scenarios. Your practice will benefit immensely from a network of peers. By regularly connecting with this community of elder law attorneys you can learn what’s working — and what’s not — within their practices. This can help you make the best decisions to better serve your clients and grow your practice. This is arguably the investment where you’ll see the biggest ROI. After all, you went to law school to learn law, not marketing. And if you’re like most lawyers, you may not know the first thing about how to sell yourself and your practice as you transition into elder law. You’ll benefit immensely from a marketing plan that includes fresh monthly content, and access to other marketing resources. Many elder law attorneys question ROI on investing in such resources, but this is a crucial area where you can’t afford to skimp. These resources will quickly pay dividends and you’ll likely see an immediate ROI. With an ElderCounsel membership, you get all of these resources and more. We understand that practicing law goes beyond running your own business. We help you to build and sustain a successful practice in the ever-changing elder law environment by arming you with support, attorney education, and development tools to streamline your elder law practice. With all of these resources at your fingertips you can focus on client relationships. You’ll spend far less time doing the work necessary to serve your clients, yet you’ll still be able to charge the same amount for your services. And that’s where the rubber meets the road when it comes to growing a successful and profitable elder law practice. If you’d like to learn more about the benefits of an ElderCounsel membership, contact us today.